We are seeing signs of Fall here in Seattle and here are two wonderful “late” summer vegetable recipes for you to try. On my last visit to the farmer’s market I picked up a nice large head of Radicchio Treviso and an even larger sized Italian Striped Zucchini. 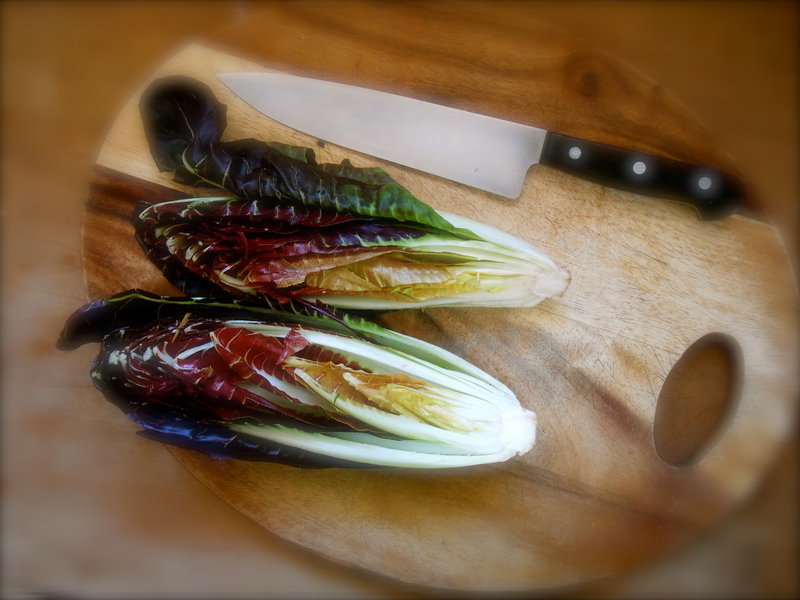 Radicchio Treviso is a leaf chicory. It is grown as a leaf vegetable and has long delicate green and magenta leaves, creamy white veins and a crinkled texture. The flavor is bitter which mellows a bit when grilled, braised or baked. Preheat the grill or grill pan. Cut radicchio in half lengthwise and rub or brush both entire halves with oil. Set radicchio cut-side down on the grill. Cook until edges are well browned, about 4 minutes. Sprinkle with salt, turn and cook until radicchio is nicely browned and wilted, about 4 more minutes. 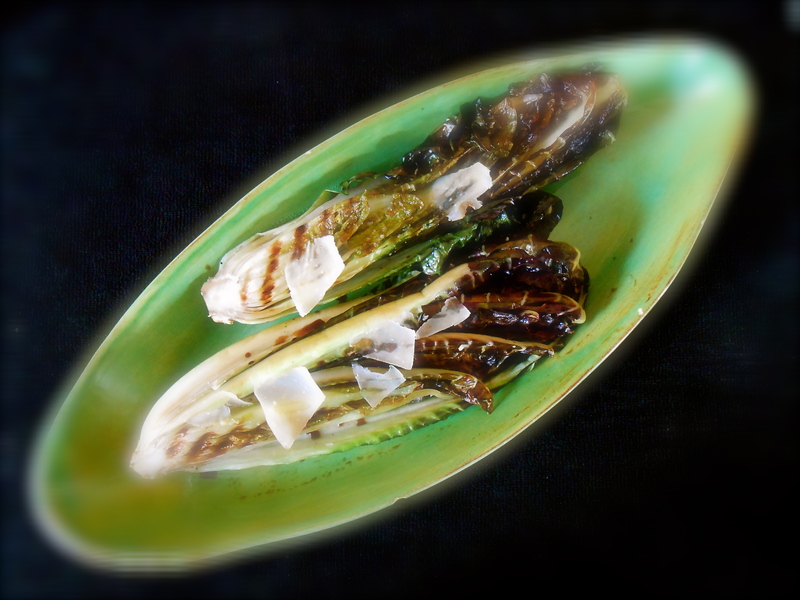 Remove radicchio from grill and drizzle with balsamic vinegar and shaved cheese of choice . Serve hot, warm, or at room temperature. I purchased the Italian Striped Zucchini with a raw ribbon salad in mind. I have been seeing so many recipes for “zucchini pasta” on blogs lately and in my usual way of shopping…, purchase now, research later, then cook, I picked out the biggest one I could find. Arriving home from the farmer’s market I set out to find my recipe. After a WordPress topic search for “zucchini pasta” I found not only this wonderful blog, but this incredible recipe for Fresh Zucchini Pasta. I happen to have every ingredient on hand so we had it that same evening. Market to table! I used a vegetable peeler and shaved the zucchini (I do not own a mandoline) however, I feel I would prefer the zucchini in the style of Alyssa’s recipe. The recipe listed below is directly from alyssaandcarla’s blog definitely click on their link and visit their blog! Combine all of the dressing ingredients into a jar, such as a mason jar, and shake to combine thoroughly. Adjust to taste. Julienne the zucchini. I used this mandoline, which I adore (and use for many different dishes). You can try to do it by hand, but a mandoline creates perfect strands. I used the mandoline on each side of the zucchini until I got near the center, where the seeds made the strands too weak and they started to fall apart. Toss the zucchini strands with the dressing. Plate the zucchini. Scatter the tomatoes, pine nuts and basil over the zucchini. Garnish with a sprinkle of parmesan. Lovely photos. Especially the first one. Technically, radicchio is not a lettuce, but a chicory, which explains its slightly bitter taste. It is closer to endive than salad :). I LOVE it and have grilled it before, I love your use of balsamic vinegar, I am sure the combination with bitter chicory must taste amazing! I wonder when we are supposed to have it in Lille, probably not before the end of September – beginning of October… I’ll be making this when the time comes! Oh… I live in the biggest endive-producing area in France :) ! Here, it is used in thousands of different ways (baked, gratineed, grilled, braised, raw…) but I have NEVER tried it with hummus (perhaps because I don’t live in “hummus country”). Another something to try out in the future! Very beautiful. Nice flavor combos here. Beautiful photos, and what a wonderful recipe… I don’t like the idea of summer being over, but… such is life, right? what a fun dish! I had a friend try zuke pasta, but she was disappointed as she said it was bland. Thinking your recipe would take care of that :-) Will be trying as there are so many zucchini floating around. p.s. what is “striped zucchini”? I have wanted to try grilled radicchio and this makes me want to try it even more! And the zucchini pasta, oh my that looks wonderful. I don’t want to say goodbye to summer, so I’m holding on as long as possible and these two dishes might just help with that :) Have a great weekend! I know…summer is closing in on us here. It was so cool in Seattle today. This was the first time I made the zucchini pasta and wow…it was so good! :) WellI I must say I do like them raw. And I really enjoyed them tossed with garlic and olive oil. Preparing them so thinly sliced created such a nice crunchy texture. Funny how you can not even “nibble” on one in it’s raw state! Thank you for the link! And I’m so happy that you found my recipe worth re-blogging :) Lovely photo. It really is something to “write home about”. I really want one of those mandolins! We’ll be having this many times. Thank you! Very nice indeed and very inventive. Thank you. :) You have some very inventive things happening in your kitchen with all those chili’s! Love it. Looks delish! 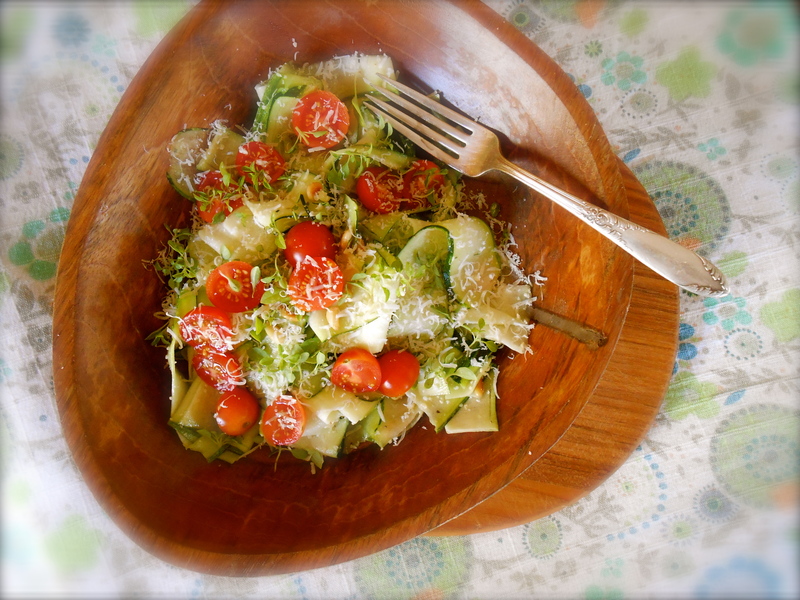 I’m bookmarking your zucchini pasta recipe for later! Great! Hope you get a chance to make it. So fresh, and it is all raw vegetables! It’s lovely. Great! Are you a fan of radicchio? I like it very much, but I know it quite bitter for some. Hope you get to the “other” market! Gorgeous!!! I I am a big fan of radicchio treviso and love zucchini pasta. Perfect light meal, full of flavor. LOVE IT!!! Thank you! :) First time I actually had zucchini pasta and I love it too! I kept thinking I was eating pasta yet I wasn’t getting super full. Great “hot” evening meal. I love how all the ingredients are raw. Good cleansing meal! I don’t have a mandolin– your’e encouraging me to go shopping. This look so fresh and delicious. You are currently reading grilled radicchio treviso and zucchini ribbon salad at COTTAGE GROVE HOUSE.